of satellite and cable channels. BEFORE I FORGET reflects Tesler's career but is not a record of it. 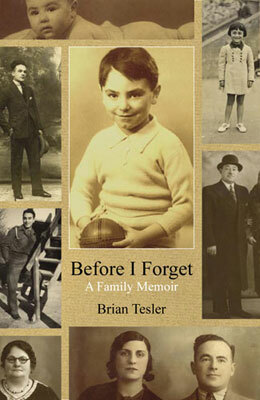 Instead it is a very personal account of his family, of the East End's vibrant Jewish community in the early decades of the last century, and of the life of a youngster in London in peacetime and in war, immersed in the radio, theatre, movies and music hall of the 1930s and 1940s. THE BEST OF TIMES is the story of Tesler's professional career. 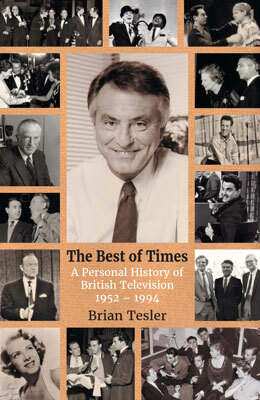 As a producer at the BBC and ATV he helped to launch or develop the careers of Roy Castle, Bob Monkhouse, Bruce Forsyth, Wilfred Pickles and Billy Cotton, and produced Saturday Spectacular shows built round such stars as Harry Secombe, Dave King, Dickie Henderson Jr, Max Bygraves, Arthur Askey, Frankie Howerd, Benny Hill, and Norman Wisdom. As Director of Programmes at ABC he introduced Tempo, ITV’s first weekly series dedicated to the arts, British TV’s first late-night chat show, presented by Eamonn Andrews, its first ‘prank’ show with Candid Camera and ITV’s first challenge to BBC’s monopoly of weekend sport with World of Sport. He was responsible for the first British television shows with Peggy Lee and Frank Sinatra, and for the revival of the television talent show with Opportunity Knocks. At Thames he presided over a Programme Department responsible for a range of programmes extending from Callan to Jennie, Lady Randolph Churchill, from The Benny Hill Show to An Evening with Jack Benny, from This Week to The World at War, from Father, Dear Father to Man About the House. At the climax of his career at LWT, his two-and-a-half day company had won, between 1980 and the 1992 Franchise Awards, more BAFTA Craft, Production and Performance Awards than any other ITV company, more Prix Italia Awards than any other ITV company, and more Montreux International Festival Rose Awards than the BBC as well as any other ITV company. He worked for four legendary television bosses: Ronnie Waldman, Lew Grade, Howard Thomas and John Freeman; and when he became a television boss himself he appointed in succession four television legends of the future: Jeremy Isaacs, Michael Grade, John Birt and Greg Dyke. He fought ITV’s corner as its representative on the British Screen Advisory Council, as a Governor of the National Film and Television School and as a Governor and, later, the Deputy Chairman of the British Film Institute. This is a history of 42 tumultuous years of British television as seen from the inside: its delights and dismays, its triumphs and disasters, its programmes and personalities, all making up what its author vividly remembers as the intoxicating and exhilarating Best of Times.